The moment I saw this video I knew we had to try this! 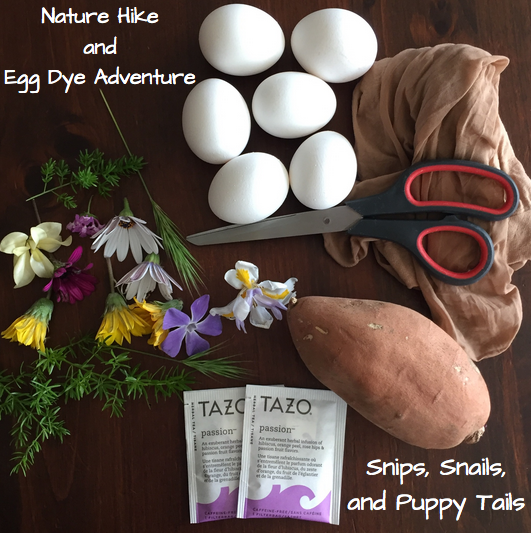 We turned this natural egg dye project into a fun adventure. You can make it as elaborate as you want, or keep it simple. Here’s what we did, but I also have other ideas to extend the fun and learning. 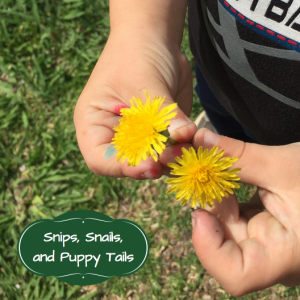 The boys and I went on a short “nature walk” around their school and our neighborhood to find flowers and leaves for our project. I allowed them to chose the flowers we would use, including some grass blades my son opted for. I figured there were no wrong choices here, although when it came time for the project, not all of our flowers made it. The daisies worked best as well as the grass and leaves. Now that our nature items were collected, we scoured the cabinets to see what options we already had on hand to avoid a grocery run. 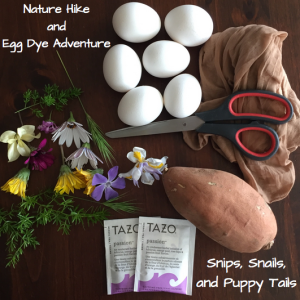 We opted for purple Tazo passion fruit tea bags and sweet potatoes to dye our eggs. After we peeled the sweet potatoes, we realized the orange hue was very mild, so we added some orange peel to deepen the color. In the video, they use cabbage and onion skins. I would recommend onion skins over the sweet potato and orange. It smelled great, but the color was very light compared to the video. To extend the project, you can visit the grocery store with your child and select the vegetables to dye the eggs. Some sample questions for learning: What colors should we chose? or Do you think this darker or lighter vegetable will add more color to the eggs? You can even expand it into an experiment if your child wants to test it out. Buy a dark and light vegetable to dye your eggs and compare when they are done. The options are endless. Finally, we set out all our materials needed for the project. Then we began to cut up our vegetables and get our pots ready for the eggs. My older son peeled the sweet potato, but even at 6, I had to guide him with the sharp peeler. My younger sons also peeled as I held my hand over their hand, so I had complete control. 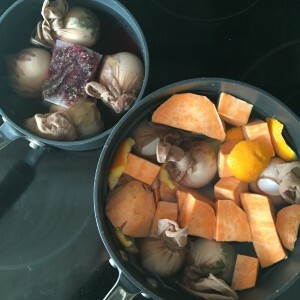 We had one pot for the tea bags and one for the sweet potato and orange peel. This next step was very hard for the kids, as the eggs are raw, and delicate hands are needed. I allowed the boys to select the flower or leaf for each egg, and I wrapped it in the nylon. Knotting the nylon was actually the hardest part of this project. I found that it did not have to cover the whole egg, but be sure to pull it tight. 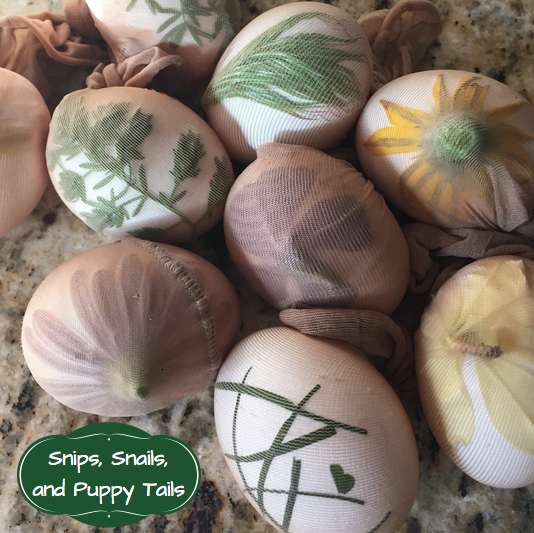 This will ensure the flowers stick to the egg during the dyeing process. After covering each egg, the boys picked which pot it went into. We filled the pots with just enough water to cover the eggs. We brought both pots to a boil then turned off the stove. Cover the pots with lids and allow the eggs to cool in the pots. Then move the pots to the fridge until your eggs are cool. I am not sure if the cold sets the dye, but I just followed the video and left them in the fridge for a few hours, as the video didn’t specify the amount of time. 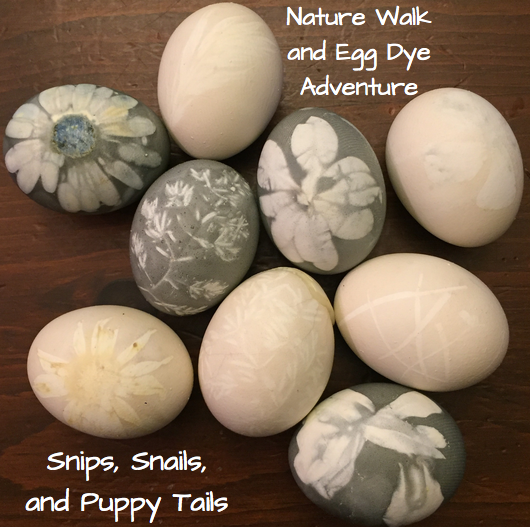 After what felt like a long wait for everyone, we removed the nylon to find these beautifully, naturally dyed eggs. If you try this, please share your pictures! 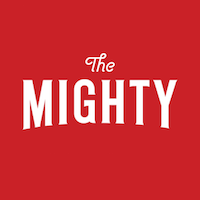 We’d love to see your creations! If you enjoyed this idea, please follow us on Facebook!